After two years of construction a 12 acre strip of downtown Los Angeles has been transformed into a multi-functional green space dubbed Grand Park – and it’s set to open to the public this weekend! Landscape architects Rios Clementi Hale Studios designed the project, which turned a cascade of parking lots and hidden spaces into a green park which provides for large scale events and casual relaxation alike. The city hopes the park will serve as an “urban oasis,” bringing a new “spirit and vitality” to the area, which sits between many of Los Angeles’ civic buildings. 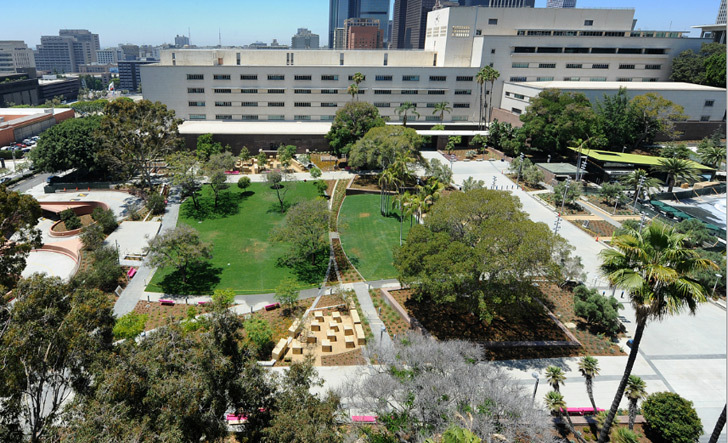 In partnership with Los Angeles County, the city has overseen the construction of the sweeping green space equipped with a space for large events and a smaller, more intimate “performance lawn.” Community terraces provide flexible spaces for meetings and individual relaxation while surrounded by beds of drought-resistant plants. At the far end of the park the historic Arthur J. Will Memorial Fountain has been restored and expanded to include a surrounding plaza and wading pool. Winding paths run through the entirety of the park, encouraging activity throughout the space. The revitalization of the stretch of Grand Avenue has come at a cost of $56 million, and follows a trend of other major metropolitan cities who have made substantial investments in downtown green spaces. While some have speculated that Grand Park could be the southern Californian city’s “own Central Park,” the park layout with its wading pools and large event field perhaps more closely resemble Chicago’s Millenium Park. Indeed, had it not been for the financial downturn, the park was initially slated to open in conjunction with a $775-million Frank Gehry-designed mixed-use development at one end of the park. 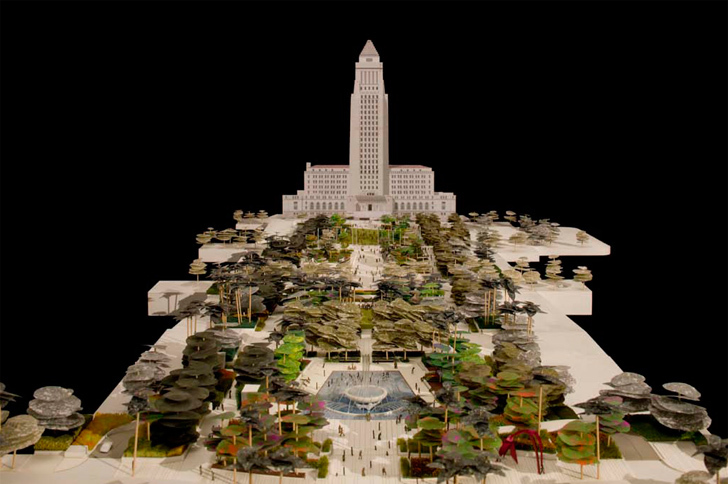 Grand Park is the first major green space to grace downtown Los Angeles, but—stretching along Temple Avenue from Grand Avenue to Spring Street—the park sits directly alongside the proposed Park 101. Park 101 would provide a green space that would cover Highway 101 as it cuts through the city’s downtown, as well as additional recreation and performance spaces across adjoining blocks. While the prospect of a large green space in downtown Los Angeles is certainly an exciting one, The Los Angeles Times is careful to note a degree of caution over the future success—and use—of a park in a 9-5 civic district. The Times quotes a succinct Peter Harnik, director of the Center for City Park Excellence as saying “The quality of this park needs to be high enough to lure jaded Los Angelenos to come check it out.” And the upcoming opening weekend of events will provide just that opportunity. After two years of construction a 12 acre strip of downtown Los Angeles has been transformed into a multi-functional green space dubbed Grand Park - and it's set to open to the public this weekend! Landscape architects Rios Clementi Hale Studios designed the project, which turned a cascade of parking lots and hidden spaces into a green park which provides for large scale events and casual relaxation alike. The city hopes the park will serve as an "urban oasis," bringing a new "spirit and vitality" to the area, which sits between many of Los Angeles' civic buildings.